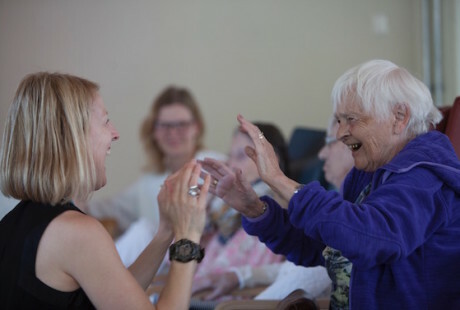 Beatrice Allegranti Dance Theatre has established an international programme of Participatory Dances for people living with dementia, their families and healthcare professionals. The company have started working in Norway and are available for residencies worldwide. 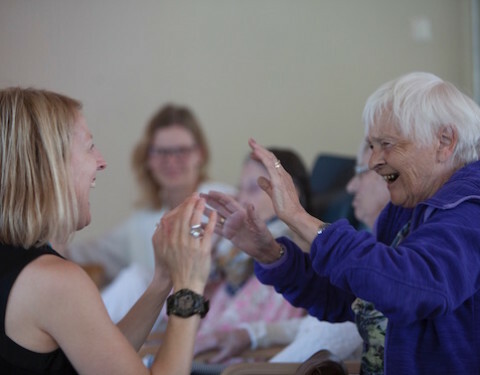 Commissioned by Festpill-Kollektivet, Festpillene i Bergen, Bergen International Festival and the Socially Engaged Arts project at the University of Bergen, the company visited two care homes in Bergen, Norway, in May 2018. The work involved introducing day care and live-in residents a basic structure of movement and sonic material that we have evolved in London. 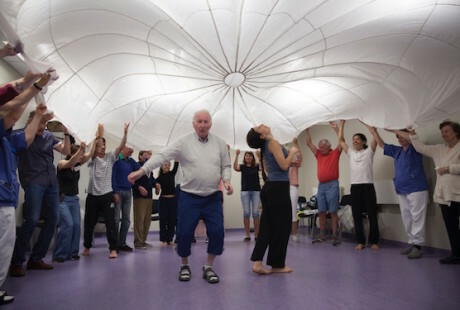 What followed was an improvisatory dance led by participants and facilitated by Beatrice Allegranti in collaboration with Jill Halstead (composer) and company dancers: Luke Birch, Sabrina Gargano, Takeshi Matsumoto, Aneta Zwierzynska. Red Cross Dementia Care Home, Bergen. “An elderly man, that reminds me of my late father, tightly grips both my hands and leads me around the outside of the circle of seated people, some dancing in micro movement exchange with one of the company dancers, some witnessing, perhaps curious. At various points I gently attempt to re-enter the circle but am met with his resistance – he pulls me back. He doesn’t say it but I imagine him saying: ‘not yet, this is not the right way in’. Later, at the end of the workshop we meet again and with his right arm around my waist he guides me out the door and together with all the other participants and nurses, we make our way up to the fifth floor to the lunch room where I sit a while longer with him. He offers me his drink. I feel like I’ve known him forever.